I believe that from my personal life experiences, the path set out for me in this lifetime is to be a specific type of Doctor…a Healer. A person who has the wisdom, compassion and intuition to see beyond the presenting symptoms, explore the depths of the soul and heal the body from within. My journey to become a healer began as a child looking for answers on how to relieve the excruciating migraine pain which I suffered from on a daily basis. Pain killers and rest were not acceptable answers for me. I needed to research and understand why I was getting migraine headaches, what was happening in my brain and how I could better treat them. This led me to study Neuroscience (the study of the brain & nervous system) at Brock University in St. Catharines, Ontario which gave me the knowledge I was seeking. I graduated in 1996 with my Honors Bachelor of Science degree in Neuroscience and my honors thesis in Fibromyalgia. Upon graduation, I continued my training to become a Naturopathic Doctor at the Canadian College of Naturopathic Medicine (CCNM) in Toronto, Ontario as I wanted to merge my passion of Neuroscience with healing through natural non-invasive therapies. I graduated from CCNM in 2001, with the mission to be the Doctor who would find the underlying cause of the patient’s disease, educate them about what was happening in their body and heal them with natural therapies. In addition to the traditional Naturopathic therapies, I furthered my Reiki training to become an Usui/Tibetan Reiki Master in 2006, and a Karuna Reiki Master in 2010 to promote healing on a deeper energetic and emotional level. It has been through my own personal healing journey of acupuncture & traditional chinese medicine, dietary changes and homeopathy that ‘cured’ me of my migraines. My quest for personal healing and transformation was further enhanced with Kundalini Yoga which found me in 2006. The inner peace, happiness and stillness I developed from my personal practice of yoga and meditation allowed me to see the healing potential it would also have on my patients. 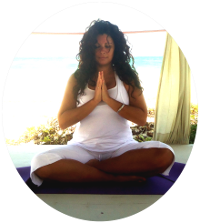 In 2008 I became a Kundalini Yoga teacher and have taught regular classes, morning sadhana, workshops and retreats. I offer private yoga instruction and meditations according to the needs of my patients to help them through any physical or emotional issues they are experiencing. As a Doctor/Healer, I have the knowledge and understanding of the body and nervous system and the privilege of applying Kundalini yoga, Reiki and Naturopathic Therapies to heal the body from within. It is my passion to empower and assist people in their healing journeys through consultations, workshops and retreats.